Begun as a Private School in 1965, parental needs expanded our program to include before and after school child care in 1971. In 1980, as a result of parent requests, we expanded our Pre-School through First Grade program to include a "one-room school" approach to the elementary grades. When needed that classroom is the home of our Pre-Kindergarten through Sixth Grade and that enrollment is limited. Here we serve all levels of ability in an individualized program designed for the maximum growth of each student. Some of our first students in this program are now college graduates and have reportedly done very well due, in part, to the strong foundation acquired at Beacon. In 1986, we began our Infant Program where we offer quality care and nurture to the youngest members of our family. Since 1971, we have offered care for children with physical, mental, and emotional special needs. Children coming to or remaining at Beacon after a busy day in school, have their own special characteristics and needs. We believe that there must be a time for active play as well as quiet work. During these after school hours, children are encouraged to relax, to explore their creative talents, to further their learning and to strengthen their personal relationships. 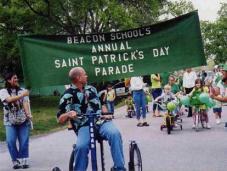 Beacon School exists to serve as a loving, Christian environment for children and their families. We are not affiliated with any particular branch of Christianity and do not exclude any child of another religion, but we do talk and sing about Jesus and God's love for us. We pray with the children daily. We believe their spiritual development is as important as their mental, physical, and emotional development. We serve as a guide, as a focusing agent for the child. Academically, we concentrate first on achieving readiness to learn and second, on challenge and SUCCESS in learning. At Beacon School children are safe, loved, and taught. Each child is a special gift from God and we welcome the challenge to guide their activities in such a way that each child enjoys learning about themselves and the world around them.